So you want to start homeschooling a foreign language. I know that learning a second language can benefit you. I had to think of way I could teach my children. Below you can read about how my children learned a foreign language and the curriculum that I have used. There are at least six benefits for homeschooling a foreign language. We are a global society. Businesses need people who can communicate in other languages. People who speak another language can find jobs in customer service, hospitals, and education. Companies also do business in other countries. Learning a language can make traveling easier. You will be able to order what you want in a restaurant. If you speak the language well you will be able to talk with the natives. If you know a foreign language you can become a missionary. Missionaries need to know the trade language of the country that they will be serving in. They may also need to learn a tribal language too. When you study a foreign language you will learn about the speaker’s culture. It is always fun to learn about different foods, music, and clothes. One of the benefits of homeschooling a foreign language is that you become more aware of your own language. Terms such as nouns, verbs, adverbs, and adjectives start to have meaning. Also colleges usually require two years of a foreign language for entrance. I think that the best way for your child to learn a foreign language is from a native speaker. The native could even be a child. The tutor could help with pronunciation and conversational grammar. It is hard to hear if you are pronouncing the words correctly when you are not talking with someone who knows the language. Another way to teach is to find a curriculum that uses CD’s or video to teach the words. You can read about the curriculum that we used below. Young children might benefit from reading picture books written in a foreign language. I have seen Spanish books in my public library. Some of the books also come with a tape or CD. If you do not feel comfortable homeschooling a foreign language your child can take a class at a junior college. If your child plans to go to college make sure that the class is for credit. Some language classes are for people who want to converse with others. These classes do not teach formal grammar. Another option is to have your child take the CLEP test. There is a test for Spanish, French, and German. I think this would be hard if you do not know the language. Two of the exercises involve listening and answering the questions. Choosing a foreign language that is right for your family depends on your interests. Some parents already speak more than one language. Some families move to a foreign country and need to learn the language. Still other families want to learn a foreign language because it is part of their heritage. How easy the language is to learn? Some languages are more difficult to learn than others. Are you interested in the culture of the country or countries where the language is spoken? Do you know a way where you can practice the language with a native speaker? The most common languages taught in school are Spanish, French, and German. American Sign Language is now being accepted by most colleges. Because of the visual and kinesthetic value of American Sign Language it is sometimes easier for children to learn. ASL is a good choice for children who struggle with language. It is often taught to autistic children. My daughter used Rosetta Stone to learn Russian. The curriculum is interactive computer software. Rosetta Stone uses the immersion approach to learning language. I did not help my daughter with the program. She also had a tutor that helped her. I am familiar with Rosetta Stone. We used the curriculum to help children with autism speak English. The lessons use images, text, and sounds to reinforce the language. I saw an image along with text describing the image. You can also hear the text being read. On the next screen you might have four pictures. You are to click on the picture that the text and speaker are describing. Rosetta Stone has many languages to choose from. One of my sons has used Flip Flop Spanish. It is for children three and above. You can read more about homeschooling Spanish here. 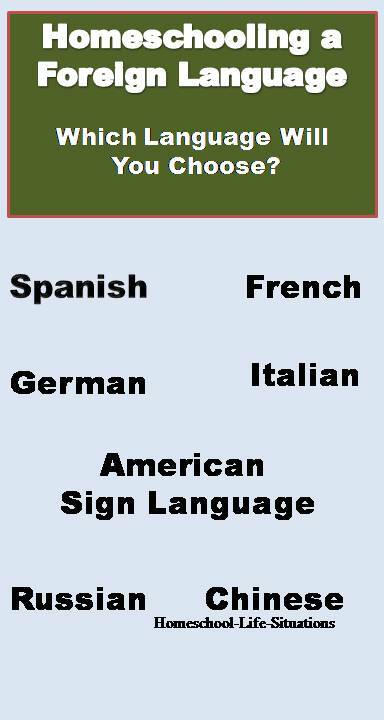 I used Instant Immersion American Sign Language v2.0 for learning ASL. It is a computer software program. I learned enough words to communicate with autistic children. I did not learn how to communicate in sentences or use ASL grammar. It uses a method similar to Rosetta Stone. I saw the words on the screen while a person signed the words. I still struggle with homeschooling a foreign language. My best solution is to find either a class or native speaker that my child can practice with.